This year, we saw top-secret photos of the birth of the atom bomb finally declassified. The photos of how the US government used that technology after World War II are just as interesting. The Department of Energy has only existed since 1977. But its roots go way back to projects overseen by multiple other agencies, like the Army Corps of Engineers and the Atomic Energy Commission, which was appointed to lead the charge into our wonderful, clean, nuclear-powered future after the war—but was abolished in the 1970s as the environmental impact and human dangers of radiation emerged. But for three decades, the AEC oversaw a broad range of projects, from putting a “nuclear heart” in cow to the slightly less dramatic task of figuring out how to design safe nuclear power plants. The Department of Energy keeps plenty of archival photos from the post-war era on Flickr, including one gigantic album of AEC-affiliated facilities, from Fermilab to the Stanford Linear Accelerator. It’s a vivid look at a complicated, sprawling organization whose legacy ranges from important to morally indefensible. Below you’ll find some of the photos, but go check out the DOE’s huge archive—seriously, it’s well worth a few minutes of your day. Housing these research activities took an incredible amount of design and engineering work, too. It’s an era of architecture that often goes totally unnoticed, perhaps except for Fermilab, also located outside of Chicago, seen above. After all, the buildings were often afterthoughts, especially in comparison to the research that was done inside the structures themselves. So who were the architects and engineers who actually planned these facilities? On the right is Thomas Downs, the chief architect of a firm called DUSAF, which was created to help design and plan the construction of Fermilab. He’s talking to Norman Ramsey, a Harvard physics professor, in front of a model of a building in 1968. The work going on inside the NAL and Argonne was staggering. For example, Argonne became home to a machine called the ZGS, or Zero Gradient Synchrotron. It was a proton accelerator that put Argonne in the spotlight thanks to its bubble chamber, where they could observe neutrinos in motion. A big part of the AEC’s mission was to develop facilities to test nuclear power plant designs. In the 1969, in Idaho, it operated the Zero Power Physics Reactor—a low-power nuclear reactor that existed solely to let scientists test out different designs and assemblies for real, full-scale nuclear power plants. This wall of square slots inside the ZPPR is a “critical assembly” where fuel could be inserted for testing inside the reactor. “Because ZPPR was operated at very low power, the materials did not become very radioactive, and they were used over and over again,” explains Argonne. “This feature, combined with the short time required to assemble a core, meant that nuclear reactors could be built and tested in ZPPR for about 0.1% of the capital cost of construction the whole power plant,” the lab writes in its history. 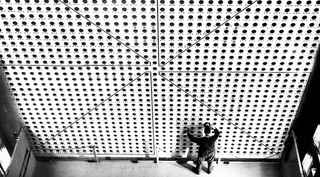 The Fast Flux Test Facility was another “test reactor” built to test nuclear power plant designs—this one in Richland, Washington. “The original purpose of the facility, although not a breeder reactor, was to develop and test advanced fuels and materials,” explains the DOE, as well as isotopes for medical research. Here’s the FFTF’s reactor vessel, arriving on a sleigh-like steel bed. The research being done at these test facilities quickly made its way into full-scale plants, like this reactor called Browns Ferry, in Alabama, seen here in 1970. This is Unit 1, the original reactor, and it’s still in operation today—after a $1.8 billion renovation in 2002. At the same time, the AEC was also overseeing construction of high-energy physics research. Below, employee works on the Stanford Linear Accelerator (SLAC)—still the longest linear accelerator in the world, even today. The accelerator was actually a collaboration between the AEC, which built it, and Stanford, which provided the land and operates it today. This 1972 photo shows a High-Intensity Radiation Source for Cobalt-60, the synthetic isotope produced by nuclear reactors. “More than 2500 grams of fully deuterated isotope hybrid blue-green algae were produced for use by the AEC’s Argonne scientists in the extraction, purification and characterization of proteins, the DOE explains about this vivid 1972 photo. Below, an employee inspects grasshoppers with a magnifying glass in 1958—though for what purpose is lost. “Light pipes are used to transmit the light flashes which occur when high energy particles pass through a scintillator to a photomultiplier tube,” says the department of this image, also from the 1970s. You can browse the entire photoset, which comprises hundreds of photos, over on the DOE’s Flickr page.